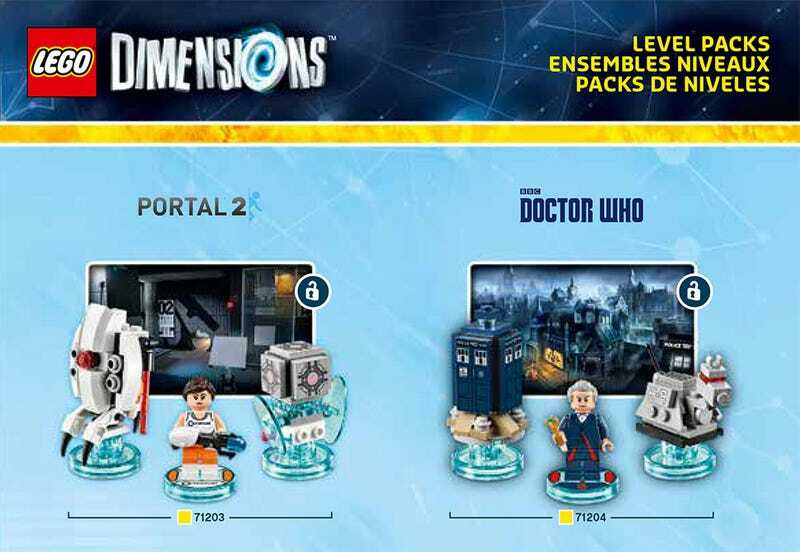 An official instruction sheet featuring a meaty list of level, team and fun packs coming to the toy-driven LEGO Dimensions proves once and for all that my wallet is truly fucked come September. While briefly-appearing Walmart ads had me skeptical, there’s no arguing with official LEGO instruction sheets. For some strange reason the LEGO Group uploaded the instruction sheet for set 71201 (via Brickset)—the Back to the Future Level Pack—which is about two pages of assembly instructions and the rest a catalog of things to come. First and most surprising are the first two level packs, which feature characters, scenery and their own interactive levels to play in. There’s a Portal 2 pack, which comes with LEGO Chell, a LEGO Turret and LEGO Companion Cube. I did not see that coming—I figured the Walmart leak was some sort of stupid mistake. Then again, Portal is getting its own pinball table soon, so why not? And the Doctor Who level, well that’s a must-buy, with a tiny TARDIS, the robot dog K-9 and Peter Capaldi, the latest incarnation of the Doctor. I knew Doctor Who LEGO was coming, but I didn’t expect it to be a part of a video game too. Not as surprising but still quite nice are the Back to the Future and The Simpsons level packs. LEGO versions of both properties already exist, so their inclusion in the game is much more close-fetched, which is an actual term people use who says it isn’t? Then come the team packs, which I am guessing are geared towards two-player fun. I’ve already purchased several Jurassic World full-size LEGO kits, so I what’s a couple more bucks on the pile? That is one sad-looking Scooby-Doo though. Finally we have the fun packs, which are packs filled with fun. We’ve got three Ninjago sets, three Lord of the Rings, three Chima (the animal dealies), Krusty the Clown, the Wicked Witch and Unikitty from The LEGO Movie, because she’s awesome. That’s a pretty big shopping list, and it’s still several sets short of what was listed during the game’s initial announcement. Throw in some more The LEGO Movie sets, some DC Comics stuff and whatnot, and I’m broke come September 29.